Over the last twenty years, power-sharing has become the dominant approach to conflict transformation, favored by national and international actors as an inclusive and pragmatic means of ending wars and building peace. Despite its burgeoning popularity, several long-standing power-sharing systems, including Bosnia-Herzegovina, Northern Ireland, Macedonia, Lebanon, and Burundi, faced some of their biggest political crises to date in 2015. Focusing on Bosnia and Northern Ireland, this article assesses what these crises mean for the state of power-sharing theory and practice. The leading model of power-sharing is consociationalism, which ensures the widespread inclusion and direct representation of all ethnopolitical groups in governance processes through executive power-sharing, proportional representation, group autonomy, and veto rights. A peace deal that offers parties a share of power is more likely to be adopted (Walter 2002) and to facilitate a durable peace (Hartzell & Hoddie 2003). Power-sharing is also recognized as a democratic means of accommodating identity difference and incentivizing cooperation (McGarry & O’Leary 2009; Lijphart 2008). While power-sharing is often adopted based on short-term pragmatism (Sriram & Zahar 2009), supporters argue that power-sharing also sets the course for long-term peace, stability and democracy. This view is not universally agreed. Some scholars argue that consociationalism cannot produce long-term stability. They contend that power-sharing incentivizes ethnic outbidding. It “may get ethnic leaders to leave the battlefield, but then after a short lull transforms the bargaining room into a new battlefield” (Roeder & Rothchild 2005, 9). When outbidding reaches the brink, parties are faced with two options: concede or defect. The implications of concession can be detrimental: concede too much and a party risks being labeled as sellouts and losing voter support. Defection can be even more dangerous, with deadly violence a frequent result (Sisk & Stefes 2005). There is also the “immobilism problem” (Horowitz 2014). Consociationalism often leads to protracted decision-making: voluntary interethnic coalitions are difficult to form, reserved seats are difficult to fill, and such negotiations can take a long time. Power-sharing arrangements are also “sticky” in that they “tend to rigidify conflicts and do not lend themselves to renegotiation” (Horowitz 2014: 12). The short-term, war-ending benefits of power-sharing conflict with the long-term desire for more than simply the absence of war, yet parties, employing better-the-devil-you-know logic, are not willing to change the rules of a system from which they currently benefit. Again, the options are limited: concede or defect. Anti-consociationalists argue that, when faced with persistent deadlock, parties start to imagine that they can do better under a different arrangement and look for an exit. From this perspective, the parties to power-sharing pacts are likely to defect when confronted with deadlock. Both Bosnia and Northern Ireland are long-standing consociations. Bosnia adopted a rigid form of power-sharing in 1995 as the means by which to end its three-year war. Institutions include a rotating three-person presidency, with a spot reserved for each of the three recognized constituent peoples (Bosniaks, Bosnian Croats, and Bosnian Serbs), strong veto rights, and legislative proportionality. Most political power in the country, however, is devolved to two entities: the Federation of Bosnia-Herzegovina co-run by Bosniaks and Bosnian Croats, and Republika Srpska (RS) where Bosnian Serb parties predominate. Overseeing the power-sharing arrangement is the High Representative, an international appointee who ensures domestic actors adhere to the terms of the Dayton Peace Accords. This arrangement, designed to protect the vital interests of the three constituent peoples, has instead facilitated a continual series of confrontations between political representatives. In the latest crisis, which started in July, RS President Milorad Dodik called – not for the first time – for a referendum on the legitimacy and jurisdiction of state-level judicial institutions. The framing of the question assuaged any doubt of how citizens were expected to vote, asking whether voters supported “the unconstitutional and unauthorized imposition of laws” by the country’s High Representative and the Bosnian Court and Prosecutor’s Office. Dodik remained determined in the face of condemnation by the international community as well as by Bosniaks living in RS who argued that the decision violated their vital interests. The referendum was delayed by a court challenge, but by the end of November a new crisis was emerging: the constitutional court ruled that the RS’s national holiday was discriminatory against other ethnic groups. RS officials carried out holiday celebrations nonetheless. Dodik’s “referendum rhetoric” (Toal 2013) – he has also stated that RS will organize a referendum on independence in 2018 – is designed to extract concessions for RS and keeps Bosnia on the brink. Each crisis feels worse than the one before. Northern Ireland’s power-sharing model, introduced as part of the Good Friday Agreement in 1998, entails a number of institutional protections for unionists and nationalists, one of which is a grand coalition government in which ministers are selected on the basis of sequential portfolio allocation. A party’s seat-share in the legislative assembly entitles them to a proportional number of executive seats; for most of the present legislative session, five parties (two unionist, two nationalist, and one binational) retained executive seats. Long considered a “star” in the power-sharing universe (Taylor 2009) for its relative stability, the Northern Irish power-sharing arrangement was rocked by police allegations in August that a still-in-existence IRA (Provisional Irish Republican Army) was complicit in a recent high-profile murder. This, combined with protracted legislative deadlock over British austerity and welfare measures, resulted in the two main unionist parties threatening to walk away from power-sharing. While the Ulster Unionist Party (UUP) ultimately pulled their one member from the coalition, the largest party, the Democratic Unionist Party (DUP), engaged an in-out tactic: their ministers would resign their portfolios only to take them back up before they could be redistributed to other parties, and then immediately resign them again. First Minister Peter Robinson explained his party’s decision by suggesting they would not be involved in “business as usual” while the crisis was ongoing. By November, things were beginning to turn around. The two largest parties, the DUP and nationalist Sinn Féin, agreed to a “fresh start” – a deal, negotiated over ten weeks of high-level talks co-chaired by the British and Irish governments. The deal is principally concerned with securing welfare reform, dealing with the impact of continued paramilitary activity, and addressing the functionality of the Northern Ireland Assembly. Northern Ireland’s other parties immediately criticized the deal as both conceding too much and not doing enough, highlighting the tenuous relationship between concession and defection in divided societies. Meanwhile, Bosnia’s crisis continues to simmer. While the planned date of 15 November came and went without a referendum, the already-tense situation was exacerbated by the state-level judicial decision to nullify the Bosnian Serb national holiday and the subsequent arrest of five Bosnian Serbs for alleged war crimes committed in 1992. These recent decisions, whether legitimate or not, are likely to bolster claims made by Bosnian Serb officials that there is “an attack on the constitutional order.” The international community has a few options available. The High Representative could invoke his so-called Bonn powers to defuse the situation. Extended by the international community at a meeting in Bonn, Germany, in 1997, these powers strengthened the High Representative’s authority from a mediating role to one that allows him to take binding decisions and to override decisions made by Bosnian politicians if they violate the terms of the Dayton Peace Accords. While past High Representatives have been heavy-handed with their Bonn powers, there is now a reluctance to employ them. Alternatively, the EU can offer further concessions through its Structured Dialogue on Justice as it did the last time Dodik threatened a referendum on judicial legitimacy back in 2011. As it has with other crises, Bosnia is likely to resolve the current crisis without defection or violence, but perhaps only with some well-timed external mediation. There are important lessons here for national and international actors who are negotiating power-sharing pacts and/or who are attempting to stabilize existing ones; these lessons point toward power-sharing favoring compromise over collapse. Recent trends in conflict transformation practice suggest a growing convergence on power-sharing as the preferred approach to a negotiated settlement. From an institutional perspective, it functions as the “moral or cognitive template” (Hall and Taylor 1996) through which the range of conflict transformation options is filtered. Arend Lijphart’s (2008) point that it is a model that “politicians and political scientists have repeatedly and independently reinvented and rediscovered” rings true. Power-sharing has been central to any proposed settlement to the Northern Ireland conflict since at least the 1970s, just as all proposed strategies for ending the Bosnian war included power-sharing. Likewise, international actors, such as the United Nations, European Union, and African Union, have supported power-sharing pacts in other divided societies. In many cases, a power-sharing solution becomes the only effective choice on offer, again recalling Lijphart’s (2008) point that in divided societies it is “either consociational democracy or no democracy at all,” though not necessarily for the reasons he anticipates. Parties are incentivized to cooperate because there are few other viable options available. Parties confronted with deadlock have to balance their own interests (e.g. how can they best maximize their share of power?) with constituent interests (can they sell concessions to their supporters?) and the interests of other parties (what is the likelihood of intra-ethnic outbidding?). They also face pressure from external actors to break the impasse without large-scale international involvement. A sellable compromise may appear unattainable with so many factors at stake, but the alternative is frequently worse, with defection often resulting in deadly violence, as recent events in Burundi suggest. Even defection short of violence can be undesirable. In Northern Ireland, direct rule from Westminster was unpalatable to Sinn Féin and unavailable to the DUP, which led them to accept concessions. For Sinn Féin this meant agreeing to the temporary transfer of welfare powers to Westminster, a gamble that allowed their nationalist rivals, the Social Democratic and Labour Party (SDLP), to frame Sinn Féin as the only nationalist party to ever give powers back to London, a hard pill for the party to swallow. For the DUP, it meant ending the in-out ministerial game in response to the British government report that concluded republican and loyalist paramilitary groups still existed but were committed to peace. A common strategy when confronted with deadlock is to convene ad hoc, high-level talks, often mediated by external actors. Going back to at least the 1970s, Northern Ireland has made full use of this tactic, dubbed derisively by some local politicians as “government by peace process negotiation.” Nonetheless, there are advantages. It can help to routinize dialogue with the other side, thereby facilitating the “spirit of accommodation” needed for power-sharing to work. Peace deals are struck when divisions are deepest and it is often a grueling process to reach any kind of agreement. Parties are consequently hesitant to reopen the agreement but, after some time, find themselves with institutions inapt to manage their current difficulties. In such circumstances, continued post-agreement mediation serves a number of important functions: “it tries to keep the signatories of the peace agreement engaged, to bring new parties in the process, and to expand as much as possible political participation” (Papagianni 2010, 245). Further talks, mediated or not, are an opportunity to flesh out the details of intentionally vague peace agreements and to address unanticipated consequences of the original deal. It can thus effectively address the “stickiness” problem. In Northern Ireland, such talks have modified the rules of the election process for the First Minister and deputy First Minister, devolved justice and policing powers to the regions, and set out a framework for reducing the number of elected Assembly members, streamlining the veto process, and creating an official opposition. This institutional tinkering can address the quirks of the original deal without undertaking a wholesale revision to the power-sharing framework, a risky enterprise. It can also facilitate public acts of compromise, such as Sinn Féin leaders meeting and shaking hands with members of the British royal family or DUP leaders attending a Gaelic Athletic Association football match. An ongoing talks process for dealing with difficult issues challenges the biggest critiques of power-sharing: deadlock, outbidding and stickiness. This is not to say that an ad hoc talks strategy always works or that the agreements reached through talks always stick. For Northern Ireland, the 2013 Haass-O’Sullivan talks broke down and the 2014 Stormont House Agreement failed to be implemented, which is why the 2015 Fresh Start talks had so much riding on them. Similarly, the talks process in Bosnia has had mixed effects. An ad hoc reform commission facilitated agreement on the creation of a single Bosnian army in 2004, a massive victory for power-sharing (Koneska 2014), but talks have failed to break the impasse on needed constitutional reforms. The 2014 protests and plenums throughout Bosnia are an important indicator of citizen disenchantment with the state of their politics when compromises fail. Failed talks are dangerous because they heighten the risk of defection, they question the bargaining power of parties, and they cast doubt on the long-term viability of the power-sharing arrangement. External actors may have a role to play in inducing parties to recommit to power-sharing, though this needs to be in a facilitating capacity rather than through imposition. It has been a tumultuous year in some of the most long-standing and (until now) most stable consociational systems. Contentious issues with no easy answers are the hallmark of politics in divided places, and even ordinary political crises are read through the legacies of the past and take on an ethnonational dimension. While Northern Ireland has stepped back from the brink, it remains to be seen how compromise can be reached in Bosnia. Whether through the daily machinations of politics or through an ad hoc talks process, power-sharing provides an opportunity to peacefully and democratically address contentious issues in an institutional setting, without the resort to violence. It is, however, ultimately up to political actors to respond to incentives for compromise. The past year of power-sharing crises suggests that while defection and collapse could yet be around the corner, power-sharing is more resilient than it first appears and thus remains an important tool for ending wars and building peace. Notable for their absence were any provisions on dealing with the past, a central thread of the talks on which the parties could not reach agreement. Lijphart’s point is that a divided society cannot have democracy without consociationalism; while this may be true, my point is that the range of options becomes limited to power-sharing because of the worldview adopted by national and international mediators. Hall, Peter and Rosemary Taylor. 1996. Political Science and the Three New Institutionalisms. Political Studies XLIV: 936-957. Hartzell, Caroline and Matthew Hoddie. 2003. Institutionalizing Peace: Power-sharing and Post-Civil War Conflict Management. American Journal of Political Science 47, 2: 318-332. Horowitz, Donald L. 2014. Ethnic Power-Sharing: Three Big Problems. Journal of Democracy 25, 2: 5-20. Lijphart, Arend. 2008. Thinking About Democracy: Power-Sharing and Majority Rule in Theory and Practice. London: Routledge. McGarry, John and Brendan O’Leary. 2009. Power Shared after the Death of Thousands. In Consociational Theory: McGarry & O’Leary and the Northern Ireland Conflict, Rupert Taylor, ed. London: Routledge, pp. 1-60. Papagianni, Katia. 2010. 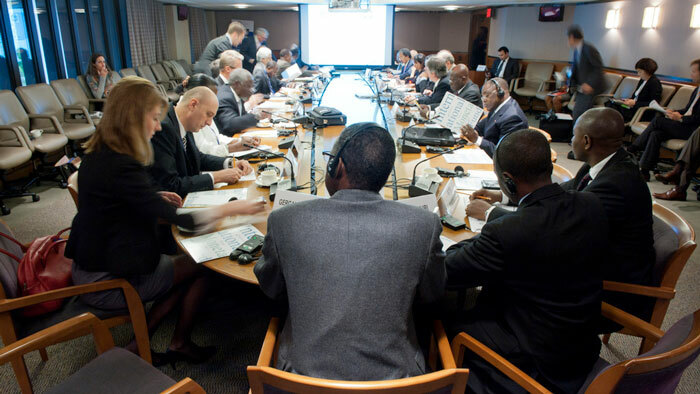 Power-Sharing, Transitional Governments and the Role of Mediation. Geneva: Centre for Humanitarian Dialogue. Roeder, Philip G. and Donald Rothchild. 2005. Power-Sharing as Impediment to Peace and Democracy. In Sustainable Peace: Power and Democracy after Civil Wars, Donald Rothchild and Philip G. Roeder, eds. Ithaca: Cornell University Press, pp. 29-50. Sisk, Timothy D. and Christoph Stefes. 2005. Power-sharing as an Interim Step in Peacebuilding: Lessons from South Africa. In Sustainable Peace: Power and Democracy after Civil Wars, Donald Rothchild and Philip G. Roeder, eds. Ithaca: Cornell University Press, pp. 293-318. Sriram, Chandra Lekha and Marie-Joëlle Zahar. 2009. The Perils of Power-sharing: Africa and Beyond. African Spectrum 44, 3: 11-39. Toal, Gerard. 2013. ‘Republika Srpska Will Have a Referendum’: The Rhetorical Politics of Milorad Dodik. Nationalities Papers 41, 1: 166-204. Walter, Barbara. 2002. Committing to Peace: The Successful Settlement of Civil Wars. Princeton: Princeton University Press. Allison McCulloch is Associate Professor of Political Science at Brandon University (Manitoba, Canada) where she teaches in the areas of International Politics and Comparative Politics. Her research considers the politics of deeply divided societies and the role of power-sharing institutions in facilitating democracy, security, and stability. She is also interested in how power-sharing can be made more inclusive, particularly from a gender perspective. She is the author of Power-Sharing and Political Stability in Deeply Divided Societies (Routledge, 2014).